This lesson will show you how to load an XML file and access the data for use in your application. 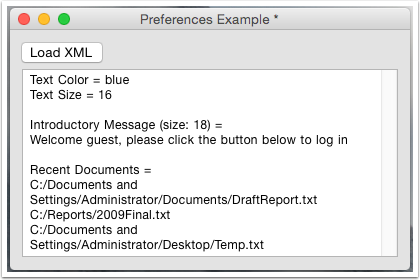 XML files are a very useful for things like storing preference settings, working with the web and for situations where you need to share data with other programs. 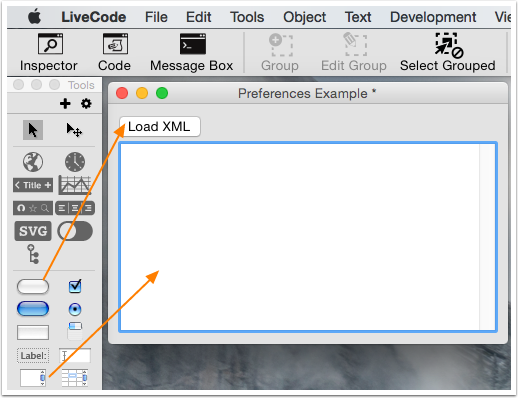 LiveCode provides a well-featured library for dealing with XML files, which can take a little getting used to but is quite straight forward to use. We start by creating a stack and dragging a button and a field onto it. The button will contain our LiveCode code for reading the XML file. The field will contain the resulting data that is read from the file, set the name of the field to "information". Save this stack on your desktop. Edit the script of the button by selecting it, then clicking on the "Script" button in the main menu bar. For this example we are going to load an XML file that contains preferences for our application. There are two parts to loading the preferences file. The first part is reading the file into memory and creating an XML "tree". The second part is to process the tree and extract the data from it. This function reads the XML file, and returns the tree. The tree is represented as a number, the actual tree structure and data is managed by LiveCode and so we don't need to worry about it. # Read the preferences we require from the tree and display them. # Close the XML tree. Next, we implement a function to read the XML. This is done in two steps, first the file is read into a variable like any other text file would be, secondly, an XML "tree" is created from the file. This tree allows us to manipulate the XML data easily. Add the code to read the XML file as below. # Find the XML file on disk. # This is for now assumed to be in the same location as the stack / application. # Note that we restore the itemDelimiter to comma (its default value) afterwards. # that can arise due to unexpected delimiter values. 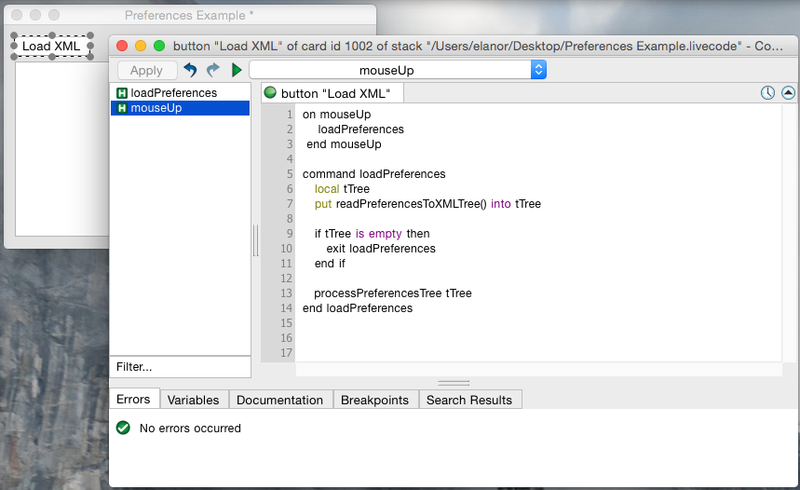 # Read the preferences data from the file into a variable. # as its possible that the file may have been deleted or moved. # checking to make sure that the file has loaded properly. # Extract the text color and text size preferences. # This function will return a string beginning with "xmlerr,"
# here as we created the file and we know it won't fail. # Extract the introductory message preference. # attribute in two separate calls. # except that you also need to tell it which attribute you want. # Extract the recent documents list. # This is a nested list of nodes, which could have any number of items. # through them and get each one in turn. # The revXMLChildNames function is useful for returning a list of nodes like this. # To get each document, we just use revXMLNodeContents again. # to get the complete path. # Now we output what we read from the file to see if it worked. To test the stack switch to Run mode and click the button. Well I did it, but there was no change to the font size nor color. this lesson describes how to load the content of an XML file and access the data. The data loaded is displayed in the "Information" field but is not applied in this lesson. If you wish to apply the values loaded, then you would have to implement this as a next step. How do you recommend going about deconstructing these? if there is content in the XML file that you think should not be in there when you process it, then you can remove that data first. Use the search and replace functionality within LiveCode to remove any characters or text that you think should not be present. You can do this because XML files are text files. You can then process the XML data as you require. Thanks for your reply. That is what I have been doing, but wasn't sure if it was the correct way to go about it. I don't know why the code I copied over does not appear above but it was tags about xml and soap, and it is these that I have removed and replaced (at both ends of the document) with my own root node.